Football for me is often basically just the excuse to meet with like-minded friends for a few beers and a sing-song. If the day out includes a journey to a nice part of the country (or further afield, if we're lucky), perhaps somewhere we've not been to before, then all the better. As such, Bristol Rovers vs Exeter City last Saturday was unusual for me. Unusual in the sense that, as I'm currently on a self-imposed drinking ban (after the liver and wallet damaging 'Mad March'), I would be journeying to the game by car and not hanging about for any length of time either before or after kick-off. The sun was shining, traffic on the M4 non-existent and finding a parking space close to the Memorial Ground was remarkably easy; I had a very good feeling about the game as we supped on pre-match drinks (non-alcoholic in my case) in the pub (well, we did arrive rather early, thanks to the aforementioned clear roads!). The pub in question, BTW, was the Royal Oak on the Gloucester Road; tastefully decorated, a good range of beers, generous food portions, an impressive garden and clearly popular with the locals (including families). Remarkable, considering that this used to be the notorious John Cabot! I had attended this same fixture, with Willie, in December 2009. Exeter dominated the possession that night, playing some neat football in the process, but created very little in the way of clear-cut chances and lost, undeservedly, 1-0. Their Arsenal-esque 'pleasing on the eye, but lacking a cutting edge' style of play clearly hadn't changed much. They passed the ball confidently (helped by a surprisingly excellent pitch), their play was fluid and characterised by a carefree attitude; in stark contrast to the one-dimensional and apprehensive-looking Rovers line-up. I'm sure that I wasn't the only Gashead present who would've bitten your hand off for a another lucky 1-0 win. It didn't seem likely this time, however ... either Rovers scoring or Rovers stopping Exeter from scoring! The home side's defence looked nervous and slow (not helped by instant fans' favourite Danny Senda limping off early, to be replaced at right-back by a third lumpen, leaden-footed centre half). The Gas lacked width and players with guile in midfield (certainly in comparison to ex-Bristol City 1982 Ltd and Weston-super-Mare play-maker Ryan Harley - the love of Willie's life - and David Noble, who was easily the MoM, IMO). Upfront they had the dwarf-like Jo Kuffour leading the line on his own. Now, top scorer Will Hoskins (who accounts for a ridiculous proportion of Rovers' goals this season) was out injured and Kuffour is, IMO, a tricky and more-than-useful lower league striker. But leading the line is not one of his specialities and it is safe to say that Rovers weren't playing to his strengths, which has often been the case since the departure of Sir Richard of Lambertshire, to Southampton, at the start of last season. Exeter's target man Richard Logan looked exactly the type of player that Rovers needed upfront (as did Peterborough loanee Rene Howe, when I saw him wear the blue and white quarters at Brentford, but he had subsequently - and rather bizarrely - been sent back to London Road) while ex-Gashead Jamie Cureton caused Danny Coles and Jamie Tunnicliffe no end of problems with his constant movement. I breathed a noticeable sigh of relief when Cureton was substituted with a quarter of an hour remaining but, within minutes of his departure, Exeter were in front (largely thanks to poor positioning/ judgement from the otherwise excellent Rovers keeper, Conrad Logan). The goalscorer was ex-Manchester United trainee Daniel Nardiello, who would add a second in injury time (not long after Rovers had come close to equalising; Kuffour having an effort cleared off the line following a goalmouth scramble). The Grecians had started the game with Logan and Cureton and ended it with Nardiello (a half-time substitute) and Gas legend Marcus Stewart upfront. Rovers, on the other hand, were reduced to sending on 19-year-old youth team graduate Eliot Richards (yet to score in the professional game) to support Kuffour. This, alone, probably explains why one team is 9th and the other 21st. Stewart had announced prior to the game was he was to retire with immediate effect after it. He got a rousing reception when coming on (and also when being mistakenly introduced as Marcus Browning by the PA man pre kick off; typical Ragbag!). The lifelong Bristol City 1982 Ltd-fan began his career with Rovers and was an integral part of their successes under Gerry Francis and then Ian Holloway in the early-to-mid 90s, before embarking on successful spells in the Premiership with Ipswich Town (19 goals in 2000/01 leading to speculation of an England call-up) and Sunderland. He would realise his dream of playing for Sh!tty in 2005 and it was during this spell back in Bristol that I found myself standing alongside him outside the Marriott hotel in the city centre, waiting for a taxi in the small hours, one Sunday morning. He had a kebab in his mouth and an attractive blonde on each arm! Good work. Back to last weekend and the M4 was, mercifully, still clear on the way home but news of wins for Tranmere, Swindon and Dagenham & Redbridge (albeit over free-falling Notts County) were tempered only by defeats for Yeovil and Walsall, the latter meaning that Rovers remained out of the relegation places, at least until the Saddlers 3-2 win over Brentford the following Tuesday. Once more, after a few decent (and rather fortunate?) results, it's not looking good for the Gas (next up Southampton; cue a Lambert hat-trick and a heavy defeat). Will they escape? I am hopeful, but wouldn't bet on it. On the topic of bets, earlier in the season (when Rovers had first slipped into the drop zone, and were only a few points behind Exeter) I had invited Willie to name his price on the Gas finishing above his beloved Grecians come the end of the campaign. He declined (which was very surprising, bearing in mind his apparent addiction to fruit machines!). He must surely regret that now! 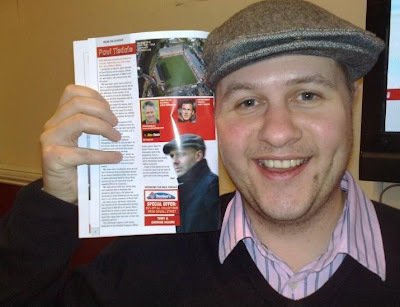 Speaking of Willie, we went corporate at Exeter vs Oldham last March for his stag do and Paul Tisdale impressed those of us who had contact with him that day* There was further praise for him from several Rovers fans on their Alternative Forum after the game. One individual posted an interesting article which gives an insight into Tisdale's hitherto successful methods. Other posters on the Rovers forum suggested that Exeter City are headed for promotion next season. While I certainly think that the often outlandishly-dressed Tisdale is the best young manager in the English game (anyone who can get a side up to 9th in League One with the hopeless Steve Tully at right-back must be a borderline genius! ), I would hate for the Grecians to over-stretch themselves. Without wishing to sound patronising, it should perhaps be remembered that not so long ago they were playing one division above the likes of Maidenhead United and Thurrock, while they exist in a city where the local rugby club has a better ground and a higher average attendance. They also only have to look at fierce neighbours Plymouth Argyle to see where a couple of seasons punching (or trying to punch) well above your weight in the Championship can get you. Relegating the Pilgrims (or, more likely, compounding their relegation) on the final day of this season, keeping hold of Tisdale and 'enduring' another year in the top half of League One would surely be more than enough for the Devonians? Whatever happens at St James Park, the club is owned by it's fans and that, I would've thought, is great comfort to Willie and his cohorts. That said, as the ever-excellent Martin Samuel points out in a recent spot-on article (with specific emphasis on supporter-owned German clubs such as Schalke 04, amongst others), ownership models that value local and grass roots involvement do not, of course, guarantee financial stability. "EXETER City manager Paul Tisdale has hit back at the fans who rounded on Ryan Harley during Saturday's 1-1 draw with Oldham Athletic. The City midfielder was jeered by a section of supporters after he was named man-of-the-match. The frosty reception came moments after Harley, who fired the Grecians in front from the spot on the hour mark, had his second penalty saved by Latics keeper Dean Brill in the final minute".